This article is about Toon Link's appearance in Super Smash Bros. Brawl. For the Wind Waker Link in other contexts, see Toon Link. For information on Links in general, see Link. Toon Link (トゥーンリンク, Toon Link) is a playable character in Super Smash Bros. Brawl. He was revealed on March 28th, 2008. He is voiced by Sachi Matsumoto, who reprises her role from The Legend of Zelda: The Wind Waker and The Legend of Zelda: Phantom Hourglass. Toon Link is a semi-clone of Link, and thus has some similar moves but different attributes. Toon Link is currently ranked 13th on the tier list at the top of the mid-high tier (making him the highest ranked character of all The Legend of Zelda characters). Toon Link's biggest asset is his variety of versatile projectiles, which when combined with his great jumping ability and air mobility, gives him one of the strongest camping abilities and makes him one of the most difficult characters to approach. Toon Link additionally has a strong aerial game, with the aforementioned efficient jumping and aerial mobility, and access to fast, powerful aerial attacks, in addition to a damaging zair, which is useful for keeping opponents at a distance and setting up subsequent attacks. Toon Link also has two great combo starters in his up tilt and back aerial that can combo into themselves, a far reaching and relatively safe recovery, and strong approaching capabilities from his fast movement speed and projectiles. Toon Link however suffers from substandard KOing ability, possessing finishers that aren't that powerful with short reach, or in the case of his up smash, being too predictable while lacking strong enough traits to make up for it. Toon Link additionally possesses short reach throughout his moveset, and a very punishable grab that lacks the reach to make up for its high ending lag (in addition to possessing rather poor throws). Toon Link overall has strong matchups (with his only counter being Meta Knight), and has achieved above average tournament results (which have been especially strong in Meta Knight-banned tournaments). Complete Classic Mode with any character on any difficulty after finishing The Subspace Emissary, then defeat Toon Link. Find Toon Link in The Forest stage after completing the Subspace Emissary. It can be found by entering a secret door close to the beginning of the level. Note that this method will not show the challenger approaching screen, as that is replaced by a cutscene of Toon Link challenging the player. The player must then defeat Toon Link on Pirate Ship. Toon Link falls under the archetype of a small but nimble character. True to his small frame, he is a floaty middleweight. Toon Link also has the ability to wall jump. His attacks generally have decent range and disjointed hitboxes (although poor compared to other swordsmen), and little lag. Toon Link has an above average aerial game and overall mobility, but he has problems KOing due to his few reliable KO moves. His best KO move is his up smash, but it is predictable. His down smash has semi-spike knockback at low damages, but it is not as powerful. The second hit of his forward smash has good knockback, but it can easily be evaded with DI, thus leaving him vulnerable. His tether grab has decent range, but it leaves him vulnerable if it misses. Projectiles, his bombs in particular, are also part of Toon Link's game, which are great for mindgames, and (like Boomerangs) can be used to combine with other attacks. He has a decently powerful ranged game due to having 3 projectiles and a grab aerial, as well as a shield to automatically block most other projectiles while standing in a stationary position (although his idle poses negate this). His Stall-Then-Fall down aerial can negate horizontal knockback (although it can also cause some unwanted self destructs), which sets up the rest of his recovery, and can also make use of bomb and tether recoveries. On the downside, his recovery is predictable, fairly easy to edge guard due his floatiness, and gives only decent distance overall. Ultimately, Toon Link becomes what his player makes of him in combining and using his advantages to mitigate disadvantage. Toon Link replaces Young Link from Melee, with some noticeable changes in his fighting style and is overall a much stronger character than Young Link. Toon Link has a much better recovery due to a higher midair jump, lower fall speed and his spin attack covering more distance (although his grab aerial is less useful for recovering). Toon Link has some moves which are very different to Young Link's with some of Toon Link's new moves being superior in almost every single way (such as his up smash and back air). His grab aerial is also much more effective as a spacing tool due to its much lower landing lag. Some of Toon Link's tools are weaker than Young Link's however. While Toon Link's dash attack has less end lag and a lot of new utility, it is significantly weaker no longer being a viable KO option. The first hit of Toon Link's down smash is also worse as it now sends opponents into the second hit removing its KO potential and making down smash much less reliable. Lastly, Toon Link's down aerial sourspot is much weaker no longer being a viable KO option. Overall, Toon Link is a significantly better character than Young Link. While Young Link's weaknesses have kept him in the mid-low tiers thoughout Melee's life, Toon Link has consolidated himself as a solid high tier in Brawl. 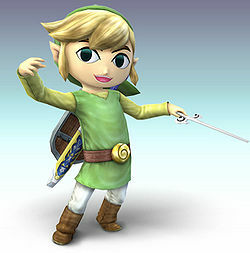 While Young Link is based on Link's younger appearance in The Legend of Zelda: Ocarina of Time, Toon Link is based on Link's appearance in The Legend of Zelda: Wind Waker. Toon Link's taunt, idle poses, and victory poses are all different from Young Link's. Toon Link walks slightly faster (1.2 → 1.22). Toon Link dashes slightly faster than Young Link in Melee (1.6 → 1.65). Toon Link's double jump gains more vertical height than Young Link's does. Toon Link sustains more knockback than Young Link despite being heavier, due to the change in the knockback formula although this can be negated once he enters tumble with the introduction of hitstun canceling. Toon Link is heavier than Young Link (85 → 92). This improves his endurance but makes him more susceptible to combos and chaingrabs. This weight increase makes Toon Link vulnerable to King Dedede's down throw chaingrab in particular whereas Young Link's weight was low enough to avoid Fox's waveshine combos. Both Brawl King Dedede's down throw and Melee Fox's shine knock down opponents whose weight is under 87 units but don't knock down opponents whose weight is 87 units or higher. Toon Link falls much slower than Young Link (2.13 → 1.28) having the 28th fastest fall speed out of 39 characters compared to Young Link having the 7th highest fall speed out of 26 characters. While this hinders his vertical endurance, it also makes him less vulnerable to combos. Toon Link's gravity is lower (0.11 → 0.07). Toon Link air speed is slower (1 → 0.94). Toon Link's air acceleration is higher (0.06 → 0.09). Toon Link's traction is lower then Young Link's in Melee (0.08 → 0.0547), especially when comparing with the returning veterans, making it harder to punish out of shield while providing minimal benefits due to the removal of wavedashing. Toon Links jumpsquat is longer (4 frames → 5). Toon Link's spotdodge has a longer duration (frames 2-15 → 2-20). The third hit of Toon Link's neutral attack has a larger hitbox. Toon Link does not a have multi-hit neutral attack like Young Link did. Rather, Toon Link has the same neutral attack as Link. The first hit of Toon Link's neutral attack has a shorter duration (frames 6-8 → 6-7). Toon Link's forward tilt has less startup lag with a longer duration (frames 11-13 → 10-13). Toon Link's forward tilt deals less damage (12%/11%/10% → 9%) without its knockback being fully compensated (5/2 (base), 100 (scaling) → 20/96, 20/90). Toon Link's up tilt has less startup (frame 9 → 8) and ending lag (frame 32 → 30), deals more damage (8% → 9%) and has higher base knockback (20 → 30) improving its KO potential. Toon Link's down tilt does not meteor smash. Instead it knocks opponents horizontally at the Sakurai angle (280°/70° → 361°). It also deals consistent damage (7%/9%/10% → 9%) and has altered knockback (80 (base), 50 (scaling) → 20/88). Toon Link's down tilt has less startup lag (frame 14 → 9), ending lag (frame 32 → 23), can lock opponents and it has a 40% chance of tripping opponents. Toon Link's down tilt has a shorter duration (frames 14-16 → 9-10). Toon Link's dash attack has less ending lag (frame 55 → 40). It also sends opponents at a lower angle (361° → 0°) making it better for edgeguarding. It also has a 30% tripping chance. Toon Link's dash attack has more startup lag with a shorter duration (frames 7-12 → 9-11). The tipper hitbox also deals less damage (11% → 8%) and his dash attack deals much less knockback (10 (base), 100 (scaling) → 35/32) significantly hindering its KO potential. The second hit of Toon Link's forward smash deals more damage (9%/11%/12% → 11%/13%) although its knockback was somewhat compensated (30 (base), 120 (scaling) → 32/25/20 (base), 110 (scaling)), has a much bigger hitbox which extends behind Toon Link and cannot be SDI'd. The first hit also has a lower SDI multiplier (1x → 0.8x). The first hit of Toon Link's forward smash sends opponents higher due to the universally decreased falling speeds making it harder to connect with the second hit and it also has more ending lag (frame 41 → 49). The second hit also has a shorter duration (4 frames → 3) and a higher hitlag multiplier (1x → 2x) making it easier to DI. Toon Link's up smash is a single upward slash rather than three slashes, making it a more reliable and stronger finisher. Its clean hit also deals more damage (11% → 15% (clean), 10% (late)) and knockback (70 (base), 70 (scaling) → 30/93). It also has less ending lag (frame 52 → 38). Toon Link's up smash has a longer duration than the first hit of Young Link's up smash (frames 11-14 → 11-13 (clean), 14-17 (late)). The second hit of Toon Link's down smash has less startup lag (frame 21 → 17), deals more knockback (30/25 (base), 90/70 (scaling) → 30/107) and now lacks a very weak sourspot. The first hit of Toon Link's down smash now launches opponents onto the second hit and has set knockback, making it less useful for launching opponents in front of Toon Link however, it increases the maximum damage output of the move (13% → 17%). The second hit also no longer semi-spikes opponents but launches them vertically (30° → 72°). As the front hit of Toon Link's down smash sends opponents into the second hit, it makes his down smash much less reliable than Young Link's down smash as his opponents can avoid the second hit. The first hit also does not have a hitbox which deals 13% damage making it deal 7% much like Young Link's sourspot and the back hit deals less damage (12% → 11%). Toon Link has a different neutral aerial. He swipes his sword in front and behind him. Both hits deal 10% damage with their base knockback compensated (10 → 20). Toon Link's neutral aerial auto-cancels earlier (frame 30 → 28) and as it has two hits, its maximum damage output is higher (12% → 20%). It can also lock and trip opponents. Toon Link's neutral aerial has more startup lag with a shorter duration (frames 4-27 → 6-7 (front), 13-14 (back)). Toon Link's forward aerial only consists of one hit instead of two making it much more reliable. It deals higher consistent damage than the first hit of Young Link's forward aerial (12%/10%/9% → 13%) and has increased knockback (0 (base), 90 (scaling) → 22/100), has less ending lag (frame 47 → 38), has a bigger hitbox, can lock and trip opponents at very low percents and despite having a later auto-cancel window (frame 47 → 51), its lower ending lag effectively makes it auto-cancel earlier allowing it to auto-cancel in a short hop. Toon Link's forward aerial has a much shorter duration (frames 14-32 → 14-15) and has more landing lag (15 frames → 18). Toon Link's has a different back aerial. He swings his sword behind him consisting of one hit. It has a longer duration than the first hit of Young Link's back aerial (frames 6-9 → 6-10), has less landing lag (15 frames → 10) and it auto-cancels earlier (frame 29 → 23) with Toon Link being able to very easily perform two back aerials in a short hop. Toon Link's back aerial has very strong combo potential at lower percents and can kill at very high percents giving it a lot more reliability and utility than Young Link's back aerial. It also has a larger disjointed hitbox and it has increased knockback (15 (base), 100 (scaling) → 18/117). Due to Toon Link's back aerial only consisting of one hit instead of two, its maximum damage output is lower (13% → 10%). It also has one more frame of ending lag (frame 30 → 31). Toon Link's up aerial is a much stronger KO move than Young Link's due to its increased knockback scaling (85 → 95) combined with the universally decreased falling speeds. It also has less landing lag (30 frames → 21) and auto-cancels earlier (frame 56 → 47). Toon Link's up aerial has more startup lag and a shorter duration (frames 5-50 → 11-40). The clean hit also deals less damage (15% → 14%) and it has less range. Toon Link's down aerial has less startup lag (frame 13 → 12) and the sweetspot is drastically easier to land. The sweetspot can also trip opponents at very low percents. It also has less landing lag (50 frames → 40). Toon Link's down aerial is a stall-then-fall that makes him fall straight down (making it more akin to the down thrust used in his Zelda game appearances). This significantly hinders its safety off stage but allows him to reach his opponents much faster and it aids his vertical endurance due to the introduction of momentum canceling. It also deals consistent damage (14%/16% → 16% (clean), 17%/12% → 13% (late) 8%/9% → 8% (after bounce)). Down aerial now meteor smashes opponents during the beginning of the plunge, rather than having a sweetspot at the hilt of Young Link's sword. Toon Link's sweetspot also does not have a fire effect. Toon Link's down aerial is much weaker especially the late hit as both hits have reduced knockback scaling (100 → 80) and the sweetspot has less base knockback (70 → 40). It also does not cover his body unlike Young Link's. Toon Link's grab aerial has significantly lower landing lag (30 frames → 2) and can lead into guaranteed follow ups. It's overall much more effective as a spacing tool on stage compared to Young Link's grab aerial. Toon Link's grab aerial also doesn't leave him helpless after using it. Toon Link's grab aerial has more startup lag (frame 9 → 11), ending lag (frame 61 → 71), and deals less damage (5% → 4%). It also has much less range and is a tether recovery rather than a wall grapple greatly reducing its recovery potential. Toon Link's grabs has more startup lag (frame 10 → 12 (standing), frame 13 → 14 (dash)). Both of Toon Link's grabs have longer durations (frame 10-13 → 12-16 (standing), 13-16 → 14-18 (dash)). Toon Link's pummel has less ending lag (frame 26 → 16). Toon Link's pummel deals less damage (3% → 2%). All of Toon Link's throws deal more damage (6% → 7%). Toon Link's forward and back throws have different animations. Toon Link's forward throw deals more knockback (25 (base), 110 (scaling) → 40/120). Toon Link's back throw launches opponents at a lower angle (130° → 150°) and has altered knockback (24 (base), 110 (scaling) → 30/105). Toon Link's down throw does not put opponents into tumble at lower percents preventing hitstun canceling and potentially allowing him to follow up after it. It also has higher knockback scaling (50 → 60). Toon Link's hookshot has more range than Young Link's. Toon Link can B-reverse Hero's Bow and Boomerang unlike Young Link. Toon Link's Hero's Bow charges faster and shoots farther. Toon Link can auto cancel an uncharged Hero's Bow in a short hop. It can also lock opponents and Toon Link has access to Quickdrawing improving its utility. Toon Link is capable of firing an arrow out of a short hop followed up with a quickdrawn arrow. The arrows are slower and does not set targets on fire like Young Link's does. They also deal less damage (8-15% → 4-12%). Toon Link's Boomerang is larger and it deals more damage from mid range (7% → 8%) and when it returns (2% → 3%). Toon Link also doesn't stop all momentum when using it and can use it while running off a ledge to gain a significant amount of horizontal momentum giving Boomerang additional edgeguarding potential. Toon Link's boomerang is slower and doesn't fly as far as Young Link's. It also deals less damage when throw (16%/19% → 12%). Spin Attack has more vertical distance and has better horizontal control. Grounded Spin Attack also has much larger hitboxes (especially the final hit) and can also be charged and deals more damage than Young Link's when fully charged (13% → 19%). Uncharged grounded Spin Attack deals less damage than Young Link's grounded spin attack (13% → 12%). Toon Link's Bombs have less combo potential and are weaker compared to Young Link's Bombs with their maximum damage output being lower (14% → 7%). The hitboxes from the explosion are bigger. It is also easier for Toon Link to make use of jump cancel throws due to his longer jumpsquat. The bombs' design and explosion effects are based off of The Legend of Zelda: The Wind Waker. Toon Link has a final smash Triforce Slash. Toon Link traps his opponents with the Triforce of Power and continuously slashes them finishing it off with a devastating blow which can easily KO the opponent. Young Link would later receive Triforce Slash as his Final Smash in Super Smash Bros. Ultimate. For a more detailed information regarding Toon Link's moveset and attack hitboxes, see this page. 3% Toon Link slashes twice then thrusts his sword forward. Primarily used as a way to create space against close-up opponents. 9% Toon Link raises his sword and swings it to the floor, similar to Link's, but with less KO power. Decent horizontal knockback makes it tolerable for edge-guarding if the blast line is nearby. 9% Quickly does a swipe overhead. Can hit on the left or right side of Toon Link. Can combo into itself at low percents, and then an aerial at higher percents. 9% Swipes his sword along the ground. Ideal for edge-guarding if an off-stage opponent is trying to grab a ledge. Can sometimes cause opponents to trip. 10% (blade), 8% (tip) Slashes directly in front of him, dealing diagonal knockback. Deals slightly less damage at the tip. 10% Toon Link pulls back and swings his sword in front of him. When the attack button is pressed again, he does another slash. The first slash leads into the second, with good horizontal knockback. 15% (clean), 11% (late) Toon Link performs a single overhead strike. Has a very similar appearance and range to his up tilt, but with much more knockback and damage. 6% (hit 1 grounded), 7% (hit 1 aerial), 11% (hit 2) Toon Link sweeps his sword in front of and then behind him along the ground. The first hit leads into the second hit on grounded opponents and cannot be SDI'd. The first hit deals more damage on aerial opponents, which knocks them upwards with decent knockback. 10% (hits 1-2) Slashes on both sides, front then back, in mid-air. The first hit can bring the target into the second hit, provided the enemy is positioned properly. Good to use as a quick approach. 13% Swings his sword upward. Good for edge-guarding in terms of leaving the stage to intercept the recovering enemy. 10% Slashes backwards with his sword. Can chain into itself at low percents and can KO foes at higher percents. 14% (clean), 12% (late) Sticks his sword above him, like Link's up aerial, though it has more knockback. A great move for juggling at mid percents, and a good KO move at later percents. 16% (clean), 13% (late), 8% (after bounce), 5% (landing) Sticks his sword straight down, similar Link's down aerial. However, Toon Link stalling momentarily in midair before launching straight downwards very quickly with no horizontal control. The beginning of the downwards descent can meteor smash the opponent powerfully, but it's very risky because if he misses, he will most likely self-destruct. Hookshot 4% Fires his Hookshot straight in front of him, just like Link's tether recovery but with shorter range. The only part of the attack which hits is the tip of the Hookshot. This attack is unique in the sense it can be used instantly out of an air dodge (a typical combo is a short hop, air dodge, tether recovery), and is practically lagless when Toon Link hits the ground. 2% Hits opponent with the hilt of the Master Sword. A fairly fast pummel. 3% (hit), 4% (throw) Drops opponent quickly and shoulder tackles them forward. Oddly, the first hit of his forward throw is considered a leg attack despite being clearly a shoulder tackle. This is possibly due to an error in his moveset coding. 3% (hit), 4% (throw) Rolls on his back with the foe and kicks the foe backward. 5% (hit), 2% (throw) Throws opponent upward and slashes them. Good combo tool. 3% (hit), 4% (throw) Brings the foe down and shoulder tackles them on the floor. Opponents gets launched behind Toon Link. Oddly, the first hit cannot hit Jigglypuff. It is believed that this is because Jigglypuff's low weight causes the animation to occur too quickly, the hitbox appearing and vanishing before it is checked for. 6% Does two slashes front and back. 6% Does another two slashes front and back. 5% Essentially the same as his other two floor attacks. 8% Pulls himself up into a front flip and slices downward. 10% Slowly climbs up and stabs in front of himself. Hero's Bow 4-12% Link equips his bow, with the arrows serving as projectiles. Charging increases the speed, distance and damage dealt by an arrow. Arrows are much floatier than Link's, making them very useful even with no charge, but are also notably slower. Boomerang 8% (near), 5% (middle), 3% (return) Tosses a boomerang that flies forward to hit opponents, and returns to the user while still being able to hit foes. Can be angled up or down. A "smash throw" (similar to performing a smash attack) increases the distance the boomerang can travel. Close up, it can be used to follow up with another attack, and on the way back, can disrupt foes (Ex. If Toon Link gets grabbed) and turn the tide of battle albeit with weak knockback. Aerial: 4% (hit 1), 2% (hits 2-4), 4% (hit 5) Toon Link sticks his blade out and spins around rapidly, hitting opponents multiple times before knocking them in different directions. Useful for catching rolls. The grounded version can be charged for more damage, while the aerial version gives him vertical and horizontal ascension. Bomb 3% (explosion), 5% (throw), 6% (smash throw), 2-7% (dropped) Toon Link pulls out a bomb. The bomb can be thrown upwards, downwards, left, or right, and if Toon Link is in the air, he can press the grab button to drop the bomb on the ground. If Toon Link drops a bomb while he is close to the ground, the bomb will land on the ground and will not explode until the fuse runs out, but other players can pick up the bomb and use it themselves. The blast radius of the bombs larger that Link’s bombs, but deals less damage. This move is a very good move for setting up combos and can grant him an extra Spin attack if used skillfully. Triforce Slash 5% (trapping), 4% (hits 1-15), 18% (hit 16) Toon Link locks onto an opponent and proceeds to slash them repeatedly with his Master Sword. A luminous image of the Triforce appears around the opponent as Toon Link slashes them. The final strike launches the opponent. Appears from an explosion that is similar to the ones used in The Wind Waker, and then quickly equips his sword and shield. Up taunt: Conducts with his Wind Waker baton, at the end of which, a sound from when Toon Link plays a melody in The Wind Waker is heard. Side taunt: Puts his sword away and looks around the environment. Down taunt: Panics while slashing his sword around wildly, which tires him out. Tap the tip of his boot on the ground. Toon Link makes a noise from the Wind Waker and shouts similar to his up smash. This flourish is a cover of the music that played whenever Link obtained a Triforce Piece in The Legend of Zelda. Up: He catches a pig and holds it above his head. Left: He waves the Wind Waker baton. This pose is extremely similar to his Up Taunt. Right: He tries to catch a pig, but ends up tripping and falling on his bottom..
Toon Link has good matchups overall. He is countered by 1 character, Meta Knight, soft countered by 8, has 7 even matchups, soft counters 11, counters 8, and hard counters 1, Ganondorf. Toon Link's projectiles make him an effective zoner, and his disjointed hitbox also helps. His semi-powerful moves for his weight class make him a threat. He also is not hindered by the flaws of regular Link, meaning he is good in the air and has an amazing recovery. His projectiles help him greatly against matchups like the Ice Climbers, so much so it fact that he is one of four characters who soft counters them. The Ice Climbers have a hard time approaching and grabbing the slippery Toon Link, aiding him tremendously in that matchup. Everyone else higher tiered than him at least soft counters him (Except Diddy Kong and Lucario.) Meta Knight in particular has an easy time with Toon Link because of the amount of options he has that can overwhelm him. Hyro - A top Toon Link player from Louisiana. Jash - Was known as the best Toon Link in the United States before his inactivity in 2012. Hyuga - Best Toon Link in Mexico. Jerm - A top Toon Link player from Texas. Kingtoon - Often considered to be the second best Toon Link behind MJG. MJG - Widely considered to be the best Toon Link player in the United States and the world. Toon Link is an optional character in the Subspace Emissary, similar to Jigglypuff and Wolf, who can only be unlocked after the mode has been completed. To find him, players must enter a new door in the Forest which appears after defeating Tabuu for the first time that takes them to the Pirate Ship, where Toon Link prepares for battle. Defeating Toon Link will add him to the player's team. He does not have an actual role in the overall plot. Toon Link uses his sword for all of his attacks except his back throw, forward throw, and down throw. Because of this, he benefits greatly from [Slash] and [Weapon] Damage boosts. Toon Link has more ranged specials than direct, so a [Specials: Indirect] boost would also be beneficial to him. Event 37: The Pirate Airship: As Toon Link, the player must KO both Yoshis on Pirate Ship while the ship is in the air. Event 39: All-Star Battle x2: Toon Link is one of the eight opponents fought in this event along with King Dedede, Ike, Lucario, R.O.B., Snake, Sonic, and Wolf. Co-Op Event 15: Four Swords Brawl: Both players control Toon Link and face off against two other Toon Links. Both players must work together to collect 500 coins before the opposing team does. Toon Link's main and Final Smash trophies can be obtained by clearing Classic Mode and All-Star mode respectively with Toon Link. Toon Link's Final Smash. Hit an enemy with the light emanating from the Triforce mark on his hand to initiate the move. The enemy will be trapped within the Triforce and be unable to move—Toon Link will then rush in close and carve up his foe at lightning speed. The final blow will break the Triforce prison and send the opponent off the screen. Toon Link's grab aerial can be used to save him from a KO at extremely high damages, ranging up to even higher than 300%, if an attack hits him low enough that his tether is within grabbing distance of the ledge as he passes by it. This requires very fast reaction to pull off, and is not often seen in competitive play due to there being few semi-spikes with KO power (which are the only type of moves that can hit Toon Link low enough to being within grabbing distance of the ledge). Despite being able to crawl voluntarily when unequipped in The Wind Waker, Toon Link is unable to crawl in Brawl; Mario and Pit are the only other characters who act this way. Toon Link holds the world record for Level 4 and Level 5 Target Smash (Level 4 completed in 9.05 seconds, and Level 5 completed in 6.65 seconds), Co-op Target Smash Level 1 with Falco (2.66 seconds), and Co-op Target Smash Level 5 with another Toon Link (4.11 seconds). The parting in his hair is reversed from how it looks in The Wind Waker. Along with his hair, his hat also disobeys gravity, with the hat usually staying in a limp position while falling, as opposed to the tip being above the rest of his body. Toon Link has the same idle poses as Young Link in Melee. If Toon Link eats Superspicy Curry and doesn't move or attack after the effect wears off, he will not take his sword and shield back out until he finally moves or attacks. Toon Link is one of the few known characters to have an obvious error in his moveset coding: while the first hit of his forward throw is quite clearly a shoulder tackle, for sticker purposes it is considered a leg attack. This is likely an error caused by copying moveset data from Link. Toon Link has the most semi-spikes in Brawl. Masahiro Sakurai stated that Toon Link, Jigglypuff, and Wolf were almost cut from Brawl due to time constraints and their late consideration for inclusion in the game, hence why they are excluded from and cannot be unlocked while playing through the main Subspace Emissary story. This page was last edited on March 11, 2019, at 10:24.